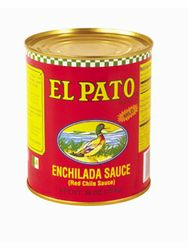 Enchilada Sauce - El Pato Red Chile Enchilada Sauce 28 oz. Enchilada Sauce - El Pato Red Chile Enchilada Sauce 28 oz.El Pato mild red chile enchilada sauce containing chiles, onions, garlic and spices. An excellent sauce for enchiladas, tamales, and assorted Mexican food dishes. The word �enchilada� invokes the image of a corn tortilla rolled around meat and cheese, dipped in chili sauce and topped with chopped onions, cheese, or sour cream. Salsa para enchiladas. Salsa de chile Colorado. My son told me about El Pato enchiladas sauce he is the only kind he bought so I decided to try it. He was right is the best enchilada sauce full of flavors, I make enchiladas and everybody on the family love it. Prosdelicious and don`t need to add any other ingredients. Not only is this sauce better tasting than most other sauces, it is lower in sodium as well. Most other brands have much more sodium than this one. Excellent sauce for enchiladas. I found it at big lots in El Paso, Texas and wish I had bought more to take home with me to Minnesota. Great flavor and consistency. By far, this is the BEST canned enchilada sauce. I only wish I could find it at our local grocery stores.